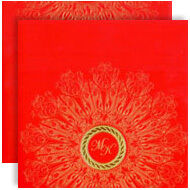 Description: A classic red card with gold design background has a gold foiled motif at the bottom where initials can be printed. Inserts are of cream and yellow base and the envelope is made of the same red card. Thank you. The invitations are beautiful. My guests loved them.